Rep. Todd Stephens (R-Montgomery) joins Gov. 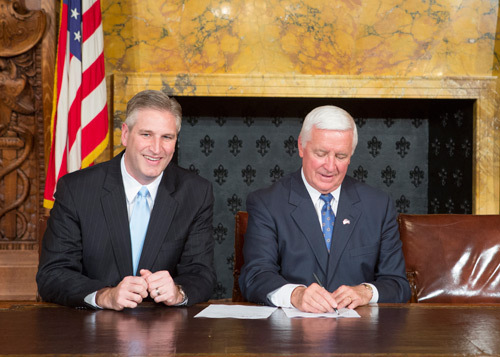 Tom Corbett has he signs Stephens’ legislation to better protect the victims of domestic violence. HARRISBURG- Legislation, sponsored by Rep. Todd Stephens (R-Montgomery) to protect victims who call for help, was signed by the governor as Act 200 of 2014. Montgomery County District Attorney Risa Ferman and Pennsylvania Coalition Against Domestic Violence Executive Director Peg Dierkers joined Stephens at the bill signing Monday. The legislation passed the House unanimously in January and passed the Senate unanimously on Oct. 16. “I want to thank the governor and the Pennsylvania District Attorneys Association for their support and the Pennsylvania Coalition Against Domestic Violence for their tireless efforts to get this bill through the Senate without amendment,” Stephens said. Act 200, formerly House Bill 1796, prohibits a municipal ordinance from penalizing a resident or landlord if police or emergency assistance was dispatched in response to an individual needing intervention or emergency assistance. While the new law preserves a municipality’s ability to combat nuisance properties and false alarms, the Pennsylvania Coalition Against Domestic Violence reports that at least 30 municipalities in Pennsylvania have ordinances that would penalize a victim for simply calling for help. The legislation was prompted by a situation in Norristown that drew national attention. In that case, according to reports, a woman suffering from a serious stab wound to her neck asked neighbors not to call 911 because she would be evicted pursuant to a local ordinance the municipality had adopted. When the woman lost consciousness due to her injuries, an ambulance was summoned and she was taken to a hospital. Norristown subsequently forced the woman’s landlord to evict her. That case was settled with the ACLU last month when Norristown agreed to revoke its “nuisance ordinance,” which sought to evict renters who called police more than three times in four months. The new law takes effect at the end of January.